The feedback activity enables teachers to create a customized survey for collecting feedback through a variety of question types. PLEASE NOTE: There are two different ways to complete the next step depending on which view you are in. 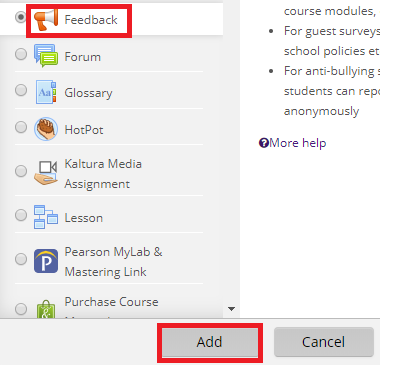 If you see two separate drop-down boxes, click Add an activity and select Feedback. For more information about this option, view Activity Chooser Options. 4. Select Feedback and click Add. 5. Assign a Name and Description to the feedback. 6. To set timing for the survey, check the box next to "Open the feedback at" and "Close the feedback at." 7. Personalize the feedback activity in the feedback settings. This setting can be changed even after participants begin taking the survey, and the results will be shown as a mix of anonymous and named participants. NOTE - Anonymous participants will always remain anonymous. This setting determines whether students can see the results of the survey. Send email notifications, if set to “Yes,” will cause an email to be sent to the instructor after each Feedback survey submission. This setting determines how many times each user can participate in the Feedback survey. Setting this to “Yes” will allow unlimited entries for each participant. If the “Record user names” setting is “Anonymous” then multiple entries will be counted from the same user. If this setting is “Users name will be logged and shown with answers” then only the latest entry will be counted from each user. Setting the “Multiple submit” to “No” will limit each user to one entry only. NOTE – once users begin submitting answers to the Feedback survey, the “Multiple submit” setting cannot be changed. If you set the “Automatic numbers for each question” option to “Yes” then the questions in your survey will be numbered. If you set this to “No” then the questions will appear in list without numbers. This option determines what your students see after they submit the survey. If you put a website URL in the “Site after submit” box, then they will be sent to that website. NOTE – the website will open in the same browser window as the Moodle course. To return to the course, your students will need to use the browser's “Back” button. This box allows you to put text and pictures that will appear on a Moodle page after your students complete the survey. NOTE – if you put a URL in the “Site after submit” box, your students will be sent immediately to the site without viewing any content you may have put in the “Page after submit” box. 8. Click Save and display.